The Republic of the Philippines is an archipelagic nation in Southeast Asia made up of 7,107 islands containing 300,000 square kilometers (CIA). It is situated in a tropical marine climate with relatively high temperatures, high humidity, and abundant rainfall (DA 1996). The monsoon season in the Northeast of the nation is from November to April, and in the Southwest it is from May to October (CIA). It is one of the most geologically unstable areas of the globe, regularly facing typhoons, landslides, and volcanic eruptions (CIA). The population is currently 103 million people, 60 percent of who already live in coastal areas (CIA, DENR 2001). Combined with a high concentration of population and economic activity in coastal areas, it is considered one of the world’s most vulnerable regions to climate change (CIA). The economy of the Philippines has been deeply impacted by its history as a Spanish colony and subsequently a U.S. territory (Ricklefs 2010). Foreign powers have had heavy influence on the economy since the 1890’s, when North Europeans and Americans began to monopolize the import-export market (Ricklefs 2010: 210). When the Philippines became a U.S. territory in 1898, the economy became linked to that of the U.S, and political independence became constrained by economic dependence (250). Even in post-independence Philippines, the pursuit of economic development has been consistently dominated by oligarchic control of production and ties with the U.S., through both trade and aid (Ricklefs 2010: 387). The Republic is a democracy that faces real social and political challenges. International debt servicing forced the government into heavy domestic borrowing and deficit spending in the 80’s (Ricklefs 2010). Abuse of power and financial corruption by politicians are major concerns, as well as high population growth rate and inequitable distribution of income (Ricklefs 2010, CIA). Muslims make up only 5% of the population and there are high levels of poverty and social unrest in the Muslim-dominated Autonomous Region of Muslim Mindanao (ARMM) (CIA, ARMM Historical Background). Failure of the government to enforce land reform in the 1980’s has perpetuated the continued dominance of landlords, which caused unrest among landless peasants (Ricklefs 2010: 393). Though access to land may be restricted, the coastline and marine environment are public resources. In 1991, local governments became empowered through the Local Government Code that was created to devolve powers of national agencies to Local Government Units (LGU’s) (Ricklefs 2010: 441). Fish are a socially and economically coastal resource for many Filipinos. Fish form a major part of the diet, even in urban populations (Burke et al. 2002). Small-scale fisheries traditionally make up more than 50% of total marine fisheries production in the Philippines (Hoegh et al. 2009). Many people spend their time foraging local waters for fish, invertebrates and seaweeds for either direct consumption or sale in local markets. In addition to local subsistence fisheries, communities may also participate in pelagic fisheries such as tuna, the live reef fish trade, as well as the trade in aquarium fish. The live reef fish trade has flourished in recent years due to the growing demand from China and Taiwan (Hoegh et al. 2009). In the past, coastal areas and resources in the Philippines were maintained by the fact that there was a limited demand for the essential resources of space and economically valuable fish and other items, but this is no longer the case, due to a combination of factors such as population growth, increased resource extraction, and unsustainable fishing methods (DENR 2001: 31). In 2003, the Philippines ranked 11th in the world in terms of fish production and fisheries exports 2003 were valued at US$525.4 million (Burke et al. 2002). Unsustainable fishing methods have been used to keep up with market demand and have gained a significant amount of attention by the international public, especially conservation organizations (Hoegh et al. 2009). Seaweeds are an economically significant coastal resource in the Philippines that accounts for 70% of their aquaculture (BFAR 2009). Though fresh seaweed is highly valued in restaurants, this use will not be included in further analysis (Hurtado 2003). Carrageenan is derived from a red algae or seaweed, and Euchema denticulatum (formerly spinosum) and Kappaphycus alvarezii are the two main species of seaweed grown for carrageenan production (McHugh 2003). 85-90%tof the seaweed farmed in the Philippines is K. alvarezii (Hurtado 2001). Carrageenan is used globally as a binder, stabilizer, emulsifier, and gelling agent in food (dairy and processed meat) and personal care products (Bixler and Porse 2010). It is also used in pet food (McHugh 2003). Carrageenan accounts for 87% of all exported seaweed in the Philippines, a total of 1.7 million MT annually (BFAR 2009). The total market for carrageenan has a value of about US$ 300 million (McHugh 2003). Coastal Filipinos do the farming of seaweed for carrageenan mostly on a small scale, either individually, within the family, or through a cooperative. Though there are 800 documented species of seaweed in the Philippines, a monoculture of Euchema sp. or K. alvarezii is standard (BFAR 2009, McHugh 2003). Culture methods most often used are either a fixed bottom line or floating monoline and raft (McHugh 2003, BFAR 2009). It is simple to cultivate, requires low initial capital, and earns a high return on investment (Crawford 2002). Females and children, not traditionally part of fishing, are involved in aquaculture (Crawford 2002). Women work to tie propagules on lines and tend the lines alongside their husbands (Crawford 2002). The farming is labor intensive- harvesting involves diving and is usually done by men (Halwart et al. 1999). In Tawi-tawi there are some female caretakers of the farms (Halwart et al. 1999). More than 80,000 families were involved nationwide a decade ago, but all small islands are producing seaweeds now (Trono 2000, DA 1996). Though it was considered an alternative livelihood in the 80’s, it has since grown to an especially important primary livelihood in the ARMM, particularly Sulu and Tawi-Tawi, which now produces 70-80% of the nation’s seaweed (BFAR 2009). Once seaweed is harvested it needs to be dried. Farmers usually dry the seaweed then sell it to a middleman or trader who purifies it and sells it to a producer (McHugh 2003). The purifying and processing of seaweed into carrageenan often occurs prior to export. The Philippines has the largest carrageenan refining industry in Asia (Bindu and Levine 2010). Many processing facilities are located near major production sites in the Philippines (McHugh 2003). Processing mainly occurs in Cebu, Zamboanga, Metro Manila, and Laguna (DA 1996). It is filtered, condensed, and either alcohol precipitation or gel-pressing is used to make refined and semi-refined products (McHugh 2003). 58% of all seaweed produced is processed into semi-refined chips/carrageenan, 31% are exported raw (dried), and the remaining 11% are processed into refined carrageenan (BFAR 2009). Originally many smaller companies did processing, but now a few Filipino-owned companies dominate processing: Shemberg Corp, PCI Worldwide, TBK and Marcel Trading Corp (Bixler and Porse 2010). There are also a few Western companies that do primary production and processing in the Philippines, including Cargill, CPKelco, and FMC (Bixler and Porse 2010). After refinement and processing, the carrageenan is ready for export and further use. The major importers of seaweed produced in the Philippines are the USA, Germany, and the UK (BFAR 2009). In Breakfast of Biodiversity, Vandermeer and Perfecto identify a “web of causality” as the source of rain forest destruction in the Tropics (1995). It is centered around the production of a commodity (rain forest trees), and the primary users or harvesters of that commodity (Central American peasants). The web then expands to include secondary users (producers and consumers) of the commodity, the market and financing structure, the government, and environmental conditions. This framework will be applied to the commodity of seaweed and further production of carrageenan. It is necessary to begin with the web of causality framework as applied to the local scale of the Philippines. There are a handful of key participants in the local production, processing, and consumption of carrageenan. The relationships are represented in Figure 1. In the Philippines, the industry employs between 100,000-120,000 people, 90% of who are seaweed farmers (“farmer”), and the rest are processors and traders (BFAR 2009). To limit the scope, this analysis will focus on impacts on the farmers because they make up a significant part of the labor force. It is important to note that anyone considered a seaweed farmer, unless it is a woman or child, is generally also a resident of the coastal environment and a fisherman, even if only for subsistence. Farmers often lack capital and need a loan to buy seeds and equipment to begin a seaweed farm (Best Practices 2010). Loans from government agencies or processors indebt the farmer until he has a successful harvest and can pay them back. The prices paid to the farmers are generally quite low compared to the profits that are being made by secondary processors via the end products (Bindu and Levine 2010). Interest paid to financers can take away up to 75% of potential profits, reducing the farmer’s ability to change his economic situation (Best Practices 2010). When farmers fail to make good on loans to processors, sometimes traders take over financing. However, if farmers can find a better price for their harvest with another trader, the trader will lose his investment. Sometimes farmers accumulate their harvest waiting for a better price, but they risk the seaweed spoiling. The end result has been a general decline in available financing for seaweed farmers and a trend of low prices for the raw product (Habito 2011). A few significant local drivers of production are low-interest loans and programs implemented by the Bureau of Fisheries and Aquatic Resources (BFAR). BFAR has worked to increase productivity nationwide through deliberate efforts in research and extension (Habito 2011). BFAR established seaweed nurseries, promoted seaweed health management, provided post-harvest facilities and established a pilot semi-processing plant (BFAR 2009). Though these efforts may increase harvests, raising productivity can flood the market and cause prices of seaweed to drop. This results in the local buyers and traders offering lower prices to the farmer. If the value of the raw seaweed drops too much, the farmer will abandon the crop and take up other livelihoods. If he abandons the crop, then local marine life gain a food source, but any tools he used to fix the crop, such as plastic or metal stakes, will remain in the marine environment as well. The farmer may have the opportunity to either return to or increase his efforts in unsustainable fishing practices. Seaweed harvest and value is limited by multiple social factors. BFAR has identified pollution in production areas, inadequate supply of dried seaweeds for processing leading to processors’ losses, and the peace and order situation in seaweed-producing areas as factors limiting profits from harvest (BFAR 2009). Market growth and introduction of simpler processing contributed to an increase in the number of small processing companies in the Philippines, though many operate at 50 percent capacity and may be struggling to survive (McHugh 2003). Certain local ecological factors limit the amount and quality of seaweed harvested. Harvests fluctuate drastically by season and are particularly low during monsoon season. Monsoons bring strong wave action, lower water temperature, and lower salinity because of heavy rains and flooding (Hurtado 2001). Lower salinity leads to ice-ice disease that can ruin a crop and strong waves can physically destroy entire farms (Largo 1995, Hurtado 2001). Herbivory can cause losses of up to 30% of the crop’s biomass, as many marine organisms eat seaweeds, especially siganids (rabbit fish) and sea urchins (farming study). Other marine life, especially sea grasses, compete with the seaweed for resources of light and nutrients (Hurtado 2001). Wild seaweeds considered non-epiphytic “foulers” often compete directly on the line with farmed seaweed (Hurtado 2001). Positive social outcomes are increased fish catches due to rabbit fish being attracted to the farm, and economic growth leading to peace and development in Mindanao (Habito 2011). Unfortunately, seaweed farming has not been correlated with a reduction in destructive fishing practices (Crawford 2002). This is due to several factors- the time needed to tend the seaweed does not overlap fishing times of the day, and when the women are involved tending the crop, the man of the house is free to fish. This does not, however, mean that promoting seaweed farming is negative for the community- in fact, it does provide an income and also promotes community-based resource management (Crawford 2002). Seaweed farming is generally considered a non-destructive form of aquaculture in comparison with other activities (Crawford 2002). There are positive outcomes as well as slightly or potentially negative ecological outcomes. Some marine organisms gain an extra source of food (Bindu and Levine 2010). However, through competition for light, seaweeds can cause coral mortality by the overgrowth and shading of colonies, and off bottom cultivation can also directly harm corals (Sievenan 2005, Crawford 2002). They also can out compete other marine plants for sunlight and deplete water of nutrients (Bixler and Porse 2010). Biotechnology through genetic modification is used to improve seeds, enhance growth, resist disease, and endure adverse environmental conditions (DA 1996). These seaweeds are already highly successful in varied environments because they have high growth rates, asexual reproduction via fragmentation, and can be resistant to grazing in foreign environments (Bindu and Levine 2010). The effects of interactions between wild and modified organisms in this situation are not yet well documented (Bindu and Levine 2010). Another concern is the direct loss of mangroves for harvestable sea space and for raw materials; mangroves are an important ecosystem for juvenile fish and water filtration (Crawford 2002). The production of carrageenan does not end at local refinement and processing. Figure 2 illustrates the web as applied to a global scale. As previously noted, major importers of carrageenan are developed nations, namely USA, Germany, and the UK (BFAR 2009). Further processing leads to food and personal care products that are also consumed in developed nations. Similar to John Vandermeer’s model of disarticulation of the economies of the Global North and South, the product and labor begins in the Global South, but the residents of the South cannot afford the end products of shampoos and ice cream. This leads the economy of the Global North to grow as the money made by residents of the North is spent on products made in the North (Vandermeer and Perfecto 1995). 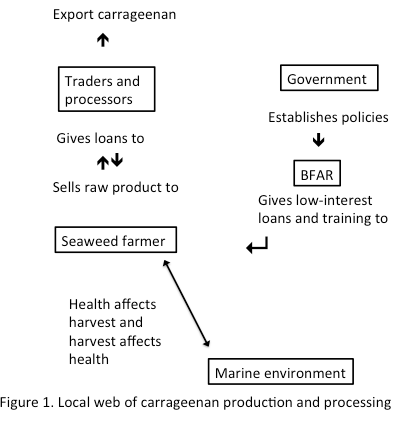 However, considering the web around carrageenan, money and support given to conservation NGO’s is actually linked back to increased seaweed production. Conservation groups also aim to decrease destructive fishing by directly protecting no-take zones, or Marine Protected Areas (MPAs). These MPAs sometimes exclude any economic or extractive activity; so coastal people are sometimes not only kept from fishing certain areas, but also barred from the potential of farming seaweed. There is at least one case of increased conflict over marine tenure to farm, in Bunaken Park (Crawford 2002). There are multiple global drivers of production, including governments and conservation NGOs. Seaweed farming has been lauded as a success in creating economic opportunity for poor coastal peoples. This has motivated nations around the world, from Fiji to India to Kenya to create similar government and aid-backed programs promoting seaweed farming (Bindu and Levine 2010). Considering the impacts of these programs and its affect back on the Filipino seaweed farmer will not be included in the expanded web. Farmer training programs and funding has been incorporated into many coastal management projects in Indonesia and the Philippines (Sievenan 2005). Conservation International and World Wildlife Fund have programs that promote it as an alternative livelihood in an effort to reduce unsustainable fishing (Conservation International, Stysliner 2011). Their campaigns do not publicly address the concern of Crawford (2002) that farming often does not reduce fishing effort. Support for seaweed farming is even coming from the Food and Agriculture Organization of the U.N., citing other benefits of using it as a sustainable source of biofuel, supplying a cheap protein source, and sequestering carbon emissions (Stysliner 2011). Increased global production will interplay with the market demand and the effects of these factors on the farmer should be considered when promoting industry growth. There is a growing consumer demand for carrageenan used as filler in low fat and pre-cooked meat products (McHugh 2003). However, even though production capacity in the Philippines is already over-built, facilities continue to be built in China and eastern Africa (McHugh 2003). These new operations could result in the export of processing, causing overall economic loss to the Philippines, or the new operations could fail if there is not sufficient demand. If overall production increases and market demand does not similarly increase, the value of the seaweed will decrease, ultimately putting the farmer out of work and driving him to fishing practices that may be unsustainable (Habito 2011). If production is held constant and market demand increases, the value of the seaweed will increase, directing the lion’s share of profits to everyone down the production chain from the farmer and still putting pressure on the coral reefs where he lives. The global commodity market may become increasingly volatile, and this unfortunately coincides with fluctuating environmental conditions. Changing environmental conditions make it increasingly difficult to anticipate harvests, as there are factors such as water temperature and storm damage that cannot be controlled by the farmer. Sea surface temperatures in Southeast Asia are already near the thermal cap of 31°Celsius, and coastal reefs are expected to warm several degrees Celsius in the next century (Kleypas and Lough 2008, Munday et al. 2008). Warmer waters are associated with increased marine diseases, especially ice-ice disease (Munday et al. 2008, Haapkyla et al. 2011, Largo 1995). Increased intensity and frequency of storms may also damage crops (Munday et al. 2008). Considering these factors, increasing the economic dependence of coastal people on a highly variable system may not be the best strategy. Instead of focusing on creating more seaweed farms just for carrageenan, it would be better for conservation groups and the Filipino government to take two new strategies. One, developing other markets and alternative livelihoods through sustainable use of other coastal resources would not only enhance economic opportunity for coastal people, it could maintain or reduce carrageenan market competition and increase the value of seaweed. Two, farming native species of seaweeds for direct consumption could actually reduce subsistence fishing efforts if people ate more of it instead of selling it. Also, farming multiple wild species of seaweed could increase the tolerance of harvests to disease and fluctuating environmental conditions. There is a global market for raw and dried seaweeds as food products, and they are increasingly popular in alternative and boutique groceries such as PCC Natural Markets in Seattle. Multiple strategies should be used to reduce overfishing, including increasing food stability and financial security through alternative livelihoods other than farming. One way to increase the trickle of profits to the farmer is through fair-trade production. There is at least one example of a local program to increase fair-trade production in place in Tuwi-Tuwi, ARMM (Philippine Embassy 2008). Though applying fair-trade principles to the production would enhance economic benefits to the farmer, the Philippines will also be competing with fair-trade products that are already coming from Ireland, South Africa, and Indonesia. However, lower production and labor costs may still enable the Filipino companies to offer products at a lower cost than other nations. Seaweed farms could also be encouraged as de-facto Marine Protected Areas, as many farmers spend a significant amount of time tending and guarding their crop. Giving landless people legal rights to marine tenure could reduce conflict like that seen in Bunaken Park. If there was an increase in the planting of seaweed for carbon sequestration, as the FAO proposes, then coral reefs may suffer from the increased competition. However, intentionally promoting productivity of the ocean could continue to bring positive benefits to coastal people if there were a diversity of “crops” and it was done sustainably; kind of like an organic garden. Crawford (2002) points out the benefits of economic diversification and the need to adjust livelihood programs to each community. Reefs are intrinsically highly biodiverse and could be utilized in a more economically diverse way. All of these strategies could be adapted for a local community in order to increase income for the farmer and reduce ecological impacts of farming seaweed. The overarching goal to reduce unsustainable fishing will not be accomplished by increased seaweed production alone. Bindu, M. and Levine, I. (2010). The commercial red seaweed- Kappaphycus alvarezii-an overview on farming and the environment. Journal of Applied Phycology 23: 789-796. Bixler, H. and Porse, H. (2010) A Decade of Change in the Seaweed Hydrocolloid Industry. Journal of Applied Phycology. Published online 22 May 2010. Bureau of Fisheries and Aquatic Resources (BFAR). (2009) Philippine Fisheries Profile. Department of Agriculture, Philippines. Dilliman, Q.C. Burke L, Selig L, and Spalding M. (2002) Reefs at Risk in Southeast Asia. World Resources Institute, Washington DC. Card, Virginia. (2002) “Algae.” Biology. Ed. Richard Robinson. Vol. 1. New York: Macmillan Reference USA. 20-22. Gale Virtual Reference Library. Web. 30 Jan. 2012. Central Intelligence Agency (CIA). The World Factbook. Accessed 28 Feb 2012. Conservation International. (2012) Global Marine Initiatives: Sulu-Sulawesi Seascape. Accessed 6 March 2012. Crawford, B. (2002) Seaweed Farming- An Alternative Livelihood for Small-Scale Fishers? Coastal Resources Center, University of Rhode Island. Department of Agriculture of the Philippines (DA). (1996) Philippines: Country Report. FAO International Technical Conference on Plant Genetic Resources. Leipzig, Germany. De Silva, S. (1992) Tropical Mariculture. Academic Press, New York. pp.28-29. Department of Environment and Natural Resources (DENR), Bureau of Fisheries and Aquatic Resources of the Department of Agriculture, and Department of the Interior and Local Government. (2001) Philippine Coastal Management Guidebook No. 1: Coastal Management Orientation and Overview. Coastal Resource Management Project of the Department of Environment and Natural Resources, Cebu City, Philippines, 58 p.
Garcia, B. (2012) Agri exec: Climate change affects seaweed production. Sun Star Publishing, Inc. 30 Jan 2012. Haapkyla, J., Unsworth, R., Flavell, M., Bourne, D., and Schaffelke, B., et al. (2011) Seasonal Rainfall and Runoff Promote Coral Disease on an Inshore Reef. PLoS ONE 6(2): e16893. Habito, C. (2011) No free lunch: Sustaining Seaweeds. Philippine Daily Inquirer. Nov 1, 2011. Accessed 29 Feb 2012. Halwart, M., Kumar, D., Bondad-Reantaso, M., Overton, L., and Balzer, P. FAO Fisheries Report No. 611. Papers presented to FAO/NACO consultation on aquaculture for sustainable rural development. Chiang Rai, Thailand. 29-31 March 1999. Hoegh-Guldberg, O., Hoegh-Guldberg, H., Veron, J.E.N., Green, A., Gomez, E. D., Lough, J., King, M., Ambariyanto, Hansen, L., Cinner, J., Dews, G., Russ, G., Schuttenberg, H. Z., Peñaflor, E.L., Eakin, C. M., Christensen, T. R. L., Abbey, M., Areki, F., Kosaka, R. A., Tewfik, A., and Oliver, J. (2009) The Coral Triangle and Climate Change: Ecosystems, People and Societies at Risk. WWF Australia, Brisbane, 276 pp. Hurtado, A., Agbayani, R., Sanares, R., and Teresa, Ma. (2001) The seasonality and economic feasibility of cultivating Kappaphycus alvarezii in Panagatan Cays, Caluya, Antique, Philippines. Aquaculture 199: 295-310. Largo, D., Fukami, K., Nishijima, T., and Ohno, M. (1995) Laboratory-induced development of the ice-ice disease of the farmed red algae Kappaphycus alvarezii and Euchema denticulatum (Solieriaceae, Gigartinales, Rhodophyta). Journal of Applied Phycology 7: 539-543. McHugh, D. (2003) A Guide to the Seaweed Industry-FAO Fisheries Technical Paper 441. Rome, Italy. Munday, P., Jones, G., Pratchett, M., and Williams, A. (2008) Climate change and the future for coral reef fishes. Fish and Fisheries, 9, 261-285. National Statistics Office (NSO). (2012) Republic of the Philippines. March 6, 2012. Parker, P. (2009) Import and Export Market for Seaweeds and Other Algae in Asia. ICON Group Ltd. Singapore & Fontainebleau, France. Ricklefs, M.C., Lockhard, B., Lau, A., Reyes, P., and Aung-Thwin, M. (2010) A New History of Southeast Asia. Palgrave Macmillan. New York, NY. 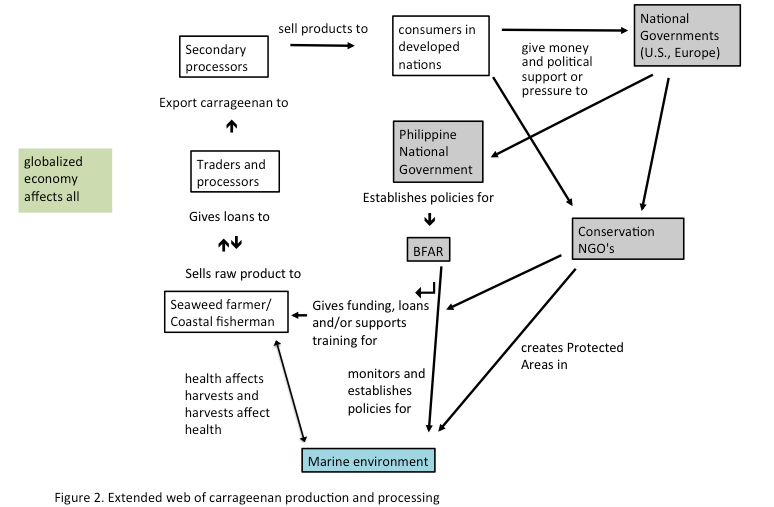 Sievenan, L., Crawford, B., Pollnac, R., and Lowe, C. (2005) Weeding through assumptions of livelihood alternatives in ICM: Seaweed farming in the Philippines and Indonesia. Ocean & Coastal Management 48: 297-313. Trono, G. (2000) Environmental implications of seaweed farming. First Mindanao Seaweed Congress. 26–27 April 2000, Zamboanga City, Philippines. Vandermeer, J. and Perfecto, I. (1995) Breakfast of Biodiversity-The Political Ecology of Rain Forest Destruction. 2nd ed. Food First Books. Oakland, CA. This entry was tagged coastal resource management, conservation, development, Philippines, poverty.